I demo the Zeeman effect with a sodium flame and 1 tesla electromagnet! Off topic for this blog, but I wanted to document the most important things I've learned after brewing for 10 years, and wish that I had known when I got started. -Avoid plastic in all parts of the brew process. Using a plastic spoon to briefly stir the wort is probably fine, but stainless steel is always better. Be wary of how the hot wort may absorb plastic flavorings as it passes through funnels, filters, hoses, or whatever your process entails. 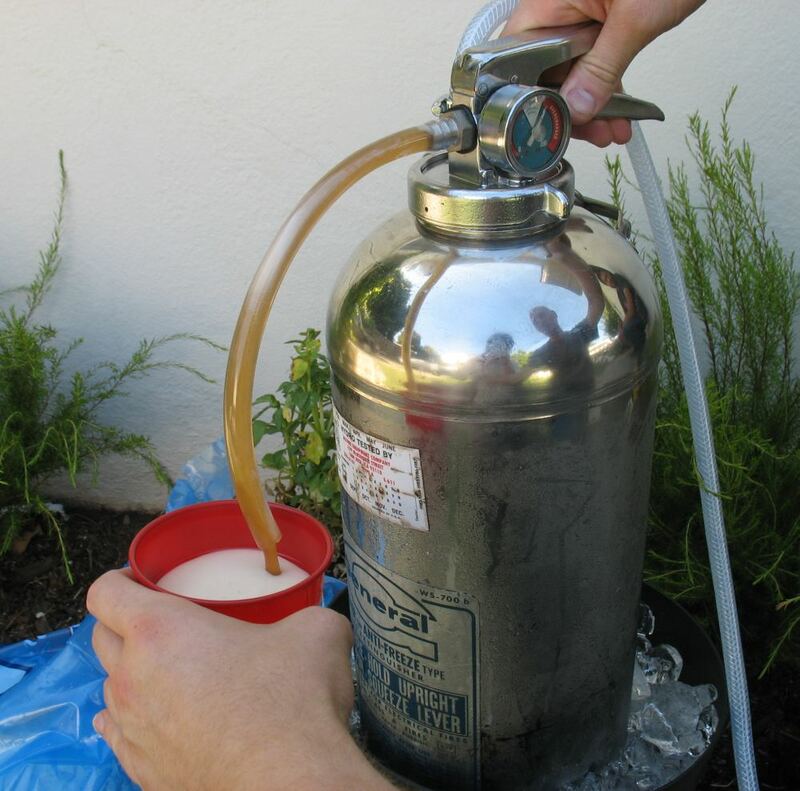 After the beer is made, do not store it in plastic, or leave plastic parts submerged in the beer. -Do *not* use a plastic fermenter bucket! Even when it is brand new, it will leech plastic flavoring into the beer, and after it's been used a few times, it will leech wild fungus/bacteria into the beer. It doesn't matter how careful you are in cleaning it. Some brewers blame the taste of "plastic bucket beer" on the oxygen permeability of the plastic. I really don't know. Just don't use a plastic bucket. -Most commercial brew recipes use far too little yeast. For a 5-gallon batch, use at *least* two packets of dry yeast, and hydrate them in a bowl (not plastic!) with a little sugar for 15 minutes before adding to the wort. Pitch the yeast when the wort is still a little warm (75*F is good). The yeast will multiply more rapidly, and get the fermentation off to a good start. - Filter or decant the trub and hop sediment after the boil. Don't just dump all of those solids into your fermenter. It will be more difficult to clean later, and the boil has already extracted all of the desirable flavor components. Filtering with a metal mesh is a good idea. - Many styles of beer benefit from dry hopping. Instead of adding the aroma hops in the last minute of the boil, put them aside. After you transfer the beer from the primary fermenter to the secondary, add the hops and filter them out later. - Clean glass carboys by filling them up to the neck with water, then add 1 cup of bleach, and fill it to the brim with water. Let it sit for a few days. The bleach will destroy organic matter in the carboy, including stuck-on chunks. After thorough rinsing and drying, the bleach will be undetectable and the glass will be so clean, water will sheet off and make rainbow interference patterns because it forms such a thin film. - Don't worry about hospital-level sterilization in the brew process. Just rinse everything with Star-San, and leave the suds (do not rinse in freshwater). The suds will not hurt the flavor of the beer at all, and the bubbles may increase head retention. - Use your nose to determine if a container (ie a fermenter) is clean. If it smells even a little funky or bleach-y, it is not ready for use. Your nose is very sensitive -- trust it! - Keep the beer in the dark at all times. I wrap a dark bath towel around the carboy, and spray water on the towel during hot months to help keep it cool. Add the filled grain bag to 2-3 gallons of cold water in an enameled stock pot, and heat to 160*F over the course of an hour, then remove the bag. Bring to boil. Shut off heat. Add malt extract and stir while turning the heat back on. Once it reaches boil, the danger of having a boil-over has passed, and you can start the 60-minute timer. Add the bittering hops. With 15 minutes remaining, add the flavor hops. With 5 minutes remaining, add Whirlfloc. When the full 60 minutes has passed, cool the wort quickly with an immersion coil cooler. After it has cooled below 100*F, pour it through a metal mesh filter (stainless steel coffee filter or tea filter is good) into a squeaky-clean 5-gallon glass carboy. Add cold water forcefully (to whip in air) to make about 5 gallons. Add 2-3 packets of dry yeast (I usually pick Safale US-05) to a bowl of warm water with a spoonful of sugar. Stir it occasionally, and when it is frothy, dump it quickly into the carboy. Add the airlock, and wait until bubbling mostly stops (1 week). Rack the beer into a second glass carboy, trying to leave as much sediment in the primary as possible. Add the aroma hop pellets directly to the secondary, replace the airlock, and wait a couple weeks. Rack the beer through a metal mesh filter into the keg, again avoiding the sediment.